A new Gallup survey shows that Americans are not nearly as confident about the country’s economic outlook as politicians and pundits in Washington, D.C. like to think. The Economic Confidence Index indicates that, aside from people enjoying an energy industry boom in northern states and federal government dollars flowing in and around Virginia and Maryland, there is very little positive sentiment in the country. 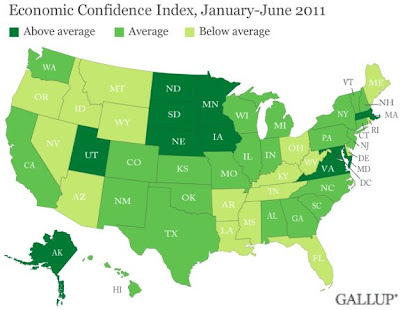 The majority of states display “average” to “below average” levels of confidence. For more on this continue reading the following article from Tim Iacono. A new Gallup survey on how Americans see the economy is not likely to sit well with Iowa Republicans as the nation’s capital is acting as a “confidence vacuum” for the rest of the country. Though it’s hard to see in the graphic below, it seems Washington D.C. has been hoovering up whatever good mood was left in the rest of the country, it being the only region posting a positive number in the survey, far outdistancing the 50 states. Times are also good in the northern energy boom states and there is a clear federal government spillover effect in Virgina and Maryland, but, other than that it’s pretty grim.